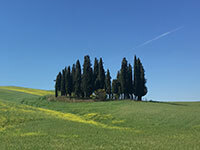 Itinerary in the great scenery of the Val d’Orcia, in a picture-perfect setting, just about 26 km north of Podere Santa Pia. There is no difficulty in following the track. It is a magical moment when halfway you reach the famous cypress trees that grace so many postcards. This itinerary (the inversion of the track Montalcino - San Quirico d'Orcia) starts in San Quirico d'Orcia, on Piazza della Libertà in front of the Chiesa di San Francesco, follows the Via Dante Alighieri towards il Duomo, La Collegiata, and further on, following the Strada di Riguardo, along the beautiful ruïn of the Pieve Madonna del Riguardo, you reach Podere Casaltina (o Casa Altina, 267 meters), where you turn right towards the most pictured cypress trees of the Val d'Orcia. 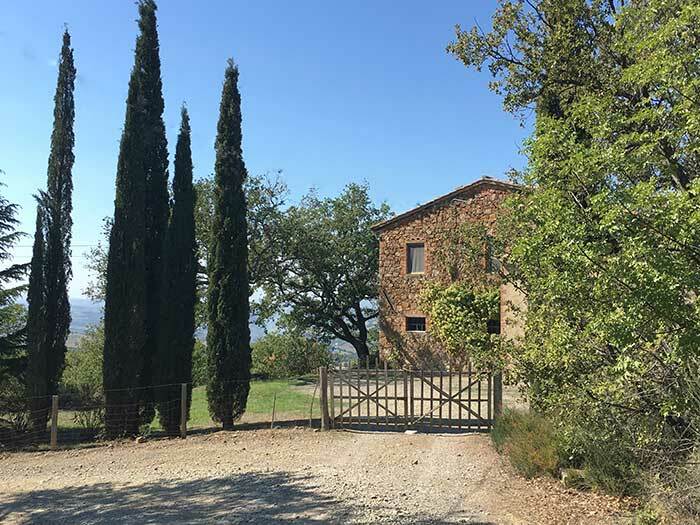 To reach Montalcino, continue on the Strada di Riguardo towards Località Bivio dell'Asso. This hike takes you to some of the most beautiful valleys of the Val ‘Orcia, dotted with silvery olive orchards, small villages, and vineyards, passing some of finest wineries on the northern slopes of Montalcino. Passing by Fattoria Pian dell'Asso, Casello, Casanova di Neri, Lazzeretti, Canalicchio di Sopra, Paradisone Colle degli Angeli, La Gerla, the Strada Comunale del Canalicchio finally brings you to Porta Burelli and Montalcino. La Gerla was founded by Sergio Rossi. The estate, localy named Colombaio, belonged to the Biondi Santi family. Sergio Rossi bought the land in 1976 and completely restructured it respecting its original environment. Shortly afterwards in 1978, he created and marketed the La Gerla brand. 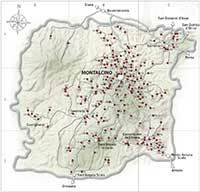 In 1967, Canalicchio di Sopra was one of the twelve founders of the Consorzio del Vino Brunello di Montalcino. Primo Pacenti founded the winery in 1962. The first bottle of Canalicchio di Sopra Brunello di Montalcino was produced in 1966. His son-in-law Pier Luigi Ripaccioli started working at his side in 1987, and since 2001, grandchildren Francesco, Marco, and Simonetta have continued family's engagement. The vineyards extend over 19ha of land within the Canalicchio and Montosoli Cru: different terrain, different exposure, different microclimates making each vineyard unique.